Royal Wedding Craziness!! What to give the couple who has everything! Jewels seem to be a safe bet. Strands of pearls, diamond necklaces, ruby earrings and elaborate tiaras were bestowed on Queen Elizabeth II (then Princess Elizabeth) when she married Prince Philip in 1947. In turn, Queen Elizabeth gave Lady Diana Spencer a rather lovely pearl and diamond tiara when she married Prince Charles in 1984. But maybe those gifts are too personal. What about a little something for the home? China is ubiquitous, such as the two hundred piece Chinese porcelain dinner service President Chiang Kai Shek presented to Queen Elizabeth. But no, the freight charges on something like that would be frightful. Perhaps a small knick knack, like the three million dollar, gem-encrusted gold model of an Arab boat the Emir of Bahrain presented to the Prince and Princess of Wales in 1984. Wouldn’t that look smashing in the Balmoral curio cabinet! But safe bets aren’t always the best bets, which is why we were intrigued by the idea of presenting the royal couple with a racehorse similar to the one the Aga Khan sent Queen Elizabeth, or perhaps something a bit boho chic, like the piece of crocheted cotton lace personally made for the self same monarch by Mahatma Gandhi – and which then Queen Mary mistook for a loin cloth! Loin cloth or not, how sick an antimacassar would that be for the royal Lazy-Boy recliner! Beginning to feel overwhelmed by a plethora of potential presents, we turned to the larder for ideas. What about five hundred cases of tinned pineapple, such as the government of New Zealand sent to –yes, her again!- Queen Elizabeth II, or a 1000 lb. wheel of Cheddar cheese, just like the one Queen Victoria and Prince Albert logged as a wedding gift in 1840? You’re right of course, it’s probably still sitting in the royal kitchen. Indeed! 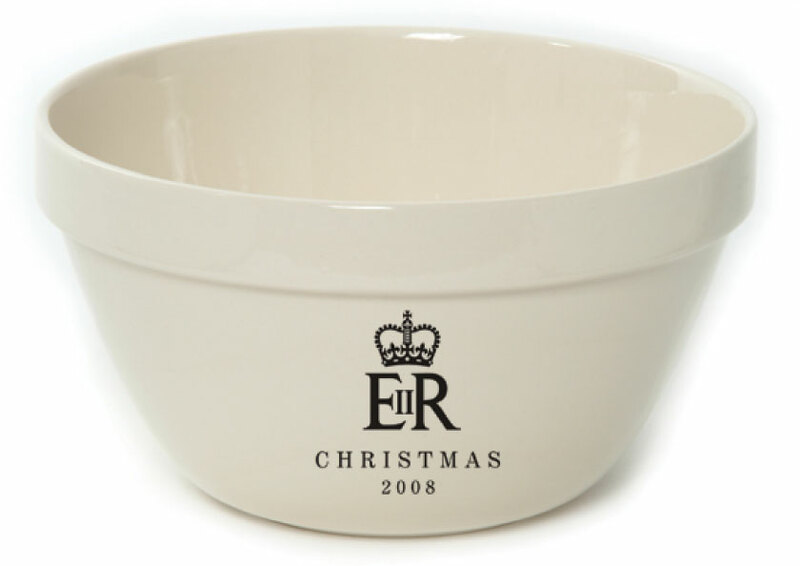 A set of Mason Cash mixing bowls is just the thing: a family heirloom Will and Kate will no doubt hand down to the bevy of royal rascals they produce. Along with a tiara or two. Can’t make the royal wedding? Get a flair of Britain in your own home with Mason Cash pudding basins used by the Royal Household are wonderful as mixing bowls, cereal & ice cream. Design fits in both traditional and modern kitchens. Mason Cash Pudding Basin With Queen of Englan seal. Posted in Mason Cash, Pacific Merchants | Comments Off on Royal Wedding Craziness!! What to give the couple who has everything! Spring is in full flower, and with it comes a blossoming sense of renewal. As we take in the glory of flora and fauna in all their youthful vigor, our thoughts turn to celebration. Menus showcase the bounty of the season: simply roasted lamb and veal, a salad of minty green peas and haricot verts, slender stalks of steamed asparagus, a bowl of ruby red strawberries tossed with balsamic vinegar. As the thought of these delightful dishes waft through our collective unconscious here at Pacific Merchants, they bring to mind a perfect dessert to accent spring entertaining: Tiramisu. 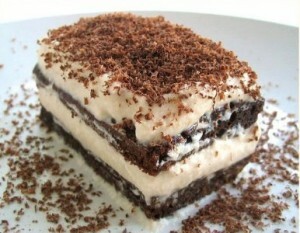 Tiramisu is an ethereal dessert composed of lady fingers, marscapone cheese, chocolate, and rum. Both delicate and complex, it literally means “lift me up” in Italian – and this recipe is guaranteed to do just that.! Tiramisu is not only a delightful foil for your delectable spring recipes, it is also easy to make in advance. All the better if you want to clock some serious nap time in your garden hammock, or better yet, engage in a little youthful vigor of your own! 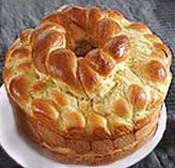 It’s also easy to prepare, and ideal to spring on friends. In a large Mason Cash mixing bowl, beat egg yolks and sugar until thick and pale, (About 5 minutes with an electric mixer, longer by hand!). Add mascarpone cheese and beat until smooth. Add 1 tablespoon of espresso and mix thoroughly. In a small Mason Cash pudding basin, add remaining espresso and rum. Roll each ladyfinger in espresso for 5 seconds only! Any longer will make the lady fingers dissolve into an unseemly mess. Place your tipsy ladyfingers on the bottom of a 11 1/2” x 8 1/2’” Mason Cash baker, breaking them up as needed to fit the bottom snugly. Cover tiramisu with plastic wrap and refrigerate for at least 2 hours, and up to 8 hours. Posted in General | Comments Off on Lift Me Up! Brisket is one of the mainstays of any Passover meal, and traditional family recipes are often guarded with the vigilance of Fort Knox gold, or emergency nuclear codes. So try and keep this one a secret, okay? Try our Brisket recipe this Passover! Yum Yum! Heat Dutch oven on stove top and add olive oil. When oil begins to sizzle, add brisket and brown on all sides, turning with tongs to ensure an even seal to meat that will retain juices during roasting. 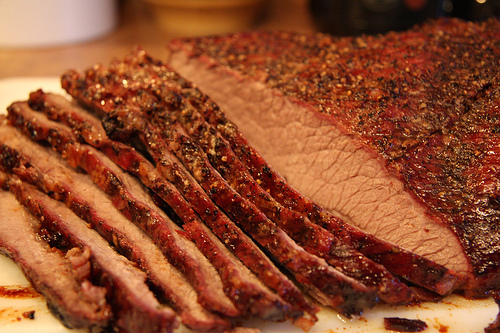 When brisket is browned, remove to a plate and set aside. Add garlic to Dutch oven and sauté until golden brown. Add 2 sliced onions and sauté until translucent. While onions and garlic sauté, combine ketchup, chili sauce, onion powder, garlic powder, liquid smoke, bay leaf, and brown sugar in medium sized mixing bowl to make barbecue sauce. Return brisket to Dutch oven and set atop onion and garlic mixture. Cover the brisket completely with barbecue sauce. Place cooking vessel in oven and reduce oven temperature immediately to 300°. Cover and cook for 2 hours, checking occasionally to make sure there is sufficient liquid in the cooking vessel. There should be about ½ an inch of liquid at all times, to keep the meat moist. Add beef stock, to increase liquid content as needed. Remove brisket from oven after two hours and let roasted meat cool for ½ hour on a cutting board or rack lightly tented with foil. While brisket is cooling, sauté diced onion until lightly golden. Set aside. Remove sautéed vegetables from Dutch oven and strain remaining cooking liquid into a degreasing cup. Clean out Dutch oven, and prepare for re-use. After brisket has rested for ½ hour and is cool enough to handle, carve into thin slices while maintaining shape of roast. Return to cooking vessel, cover roast with freshly sautéed onions, and degreased barbecue sauce. Return to oven and bake until very tender but not falling apart, another 2 to 3 hours. 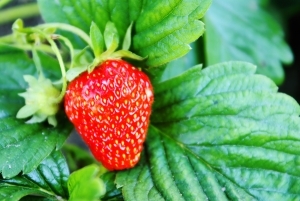 Posted in Mason Cash, Recipes | Comments Off on It’s Strawberry Season! Enter This Week’s Tea Set Giveaway Contest! Freebies and contests can be lots of fun for those who enter, and even more fun for those who win. This week, Pacific Merchants is going to give away another of our beautiful Price & Kensington five piece tea sets to one lucky winner! 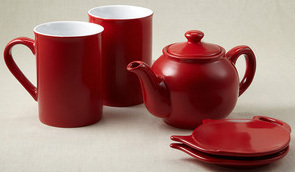 You could win this tea set (or one like it)! Our winner will get to pick any color of our five piece Price & Kensington tea sets. Each of these tea sets include one 16 ounce (two cup) teapot, two tea mugs, and two over sized teapot-shaped tea caddies. There are eight colors to choose from: cobalt blue, white, yellow, orange, red, blue, purple and green. We’ll choose our winner on Friday, April 8th, so be sure to get your entry in so that you can win, and watch our Facebook wall for the announcement of our selection! Posted in Price & Kensington | Comments Off on Enter This Week’s Tea Set Giveaway Contest! Posted in Mason Cash, Recipes | Comments Off on Bake Hot Cross Buns this Easter!